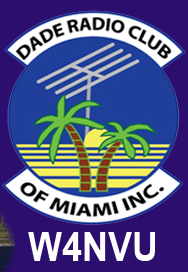 August 2011 Meeting Minutes – W4NVU – Dade Radio Club of Miami Inc.
Meeting was called to order at 19:45 with 29 present. Miguel presided over the meeting and welcomed everyone. Due to some technical difficulties, we are not broadcasting live on the air tonight. Everyone took turns and stated their name and call sign. Miguel welcomed everyone again. Miguel reminded everyone present tonight to sign in. Miguel announced that last month we lost a member Caesar Carbana to cancer, and a silent key for KGRBZA. He spoke about him to the members of his many years of dedication and service to our club and the community. Caesar will be greatly missed. He asked for a moment of silence. No July minutes were posted. Tabled until next meeting. Miguel has a current membership list. ID’s were made for those that are paid and current and they were given out. Corresponding Secretary – not hear yet. Treasurer’s Report – none. She is not here tonight. Membership dues still need to be paid. The website is our news letter. Carl is sending out via email a list of gas stations and grocery stores that have generators. He will put the list also on the website. He said that we need to print the list so that when the power goes out, we will have access to where we can find gas and groceries. 147.760 – Ray said that auto patch for some reason is not working tonight. He hoped that it was not struck by lightning. 224.200; 1291.80 and 51.660 are all still down. 444.200 – Carl said it was operating well but we need to use it more. It was suggested that we come up with an exercise to use it. It could be put together with a computer so that we could have a list. Digipeater 144.39 – was adopted by the DRC and we are responsible. The trustee would be John or Merritt or Frank. None of them are here tonight. We will check with them at the next meeting. Miami-Dade ARES/RACES Update – Carl gave an update of the frequencies that we are using. Carl is going to be sending out info to make an amateur radio book. He will also post it on the website. Get the emails and print them out for use in a disaster and when the power goes out. He said that first go to 147.000 to get information, an assignment or put on stand-by; then go to 146.520. Also sideband 144.210 and 444.200. We do not have operators to man all of the shelters. He will send out a list of shelters tomorrow. We are going to get everything back in order again. Each day there will be something new. Watch for the emails or go to the website. Carl received a call from ARRL and they are going to give the club a plaque for 50 years of service. It will be presented by David Fowler. Dave also advised that it is also 50 years that Evelyn has been with the DRC. We should invest in a plaque for her 50 years of service. She could be on a speaker phone when we present it to her at the same time that we get our plaque from ARRL. Dave made a motion to purchase a plaque for Evelyn for 50 years of service, seconded by Hollis. A vote was taken and it passed. Dave will look into it. Trophy place located Miller and 97th – called L & M. Dave will take a photo of the one that he received to emulate a similar one for Evelyn. Dave suggested that we create a membership recognition committee. Hollis asked if the members could have a copy of the list of all members. Miguel advised that it was discussed and that it was decided to keep it confidential. Many members did not want their addresses, etc. given out. Miguel spoke about our weekly net – every Wednesday night 147.000 at 7 PM. He urged members to participate. Coral Gables Races Net is Tuesday night at 7:00PM on 147.150. Cutler Bay Races meets on Wednesday nights at 7:00 PM on 146.835. Once their new repeater is installed, they will move to 146.865. Carl is working out the details on the picnic in October at Tropical Park. Anyone with photos of our last Field Day, please let us know so that they can be posted on the website so that the public can see what we do. Virgil advised that there has been nothing done about the By-Law merger because he has not heard from his committee members. Our Hamboree this year will be called Hamboree Miami. The date is March 3, 2012. Robert, Harry, Tom and Miguel are on the committee. Robert is the chairperson. The date is OK with the Shriners. Everglades Ham Radio Club’s recognition of Everglades National Park will take place December 3 and 4, 2011 at the agricultural center. We will hold off on the 50/50. No tickets tonight. Esther is not here. Dave stated that it was not too early to think about our Christmas Party. To keep it on the back burner. Hollis asked where the Channel 6 tower was and was told it was in the Redlands. Armando announced that there is a Red Cross Shelter Drill that will take place on Saturday, Aug 13 at Dr Michael Krop High School, 1410 NE 205 Street in Miami. Anyone interested please contact Armando. Kent Gelpin’s home was struck by lightning. He had no insurance. We are taking donations tonight on his behalf. Kent advised us to check our policies because even if he had insurance, it would not be covered because it did not happen during a hurricane. Homeowner policies usually don’t cover lightning. Carl will give Miguel a final list of equipment for the insurance shortly. Eddie advised us to remember that we are in the middle of hurricane season and if anyone is interested in volunteering with the Red Cross to see him or Miguel. Mike announced that anyone that is a General Class can become a VE. If anyone is interested, please see Mike. Ray asked about the new test pool of questions. Mike advised that there is a new General Class question pool. That they change every 3 years. Next year the Extra question pool will change. Anyone interested in volunteering to teach Ham classes for a couple of Saturdays back-to-back from about 9AM to 2 PM let Armando know. Dates will be put together and posted on the website. Miguel asked if there was any other business. There was none. Bill Rafus KD4FRB gave a very informative presentation on Introduction to Amateur Satellites (AMSAT) technology. It was very educational. Bill will send a package to the club with information, including plans to build antennas, where to find satellites, a list of radios to use, etc. Thank you Bill. Miguel thanked everyone for coming. A Motion to close the meeting was made by Dave, seconded by Mike. Voted and passed. The DRC meeting was adjourned at 21:27.